Max’s is one of the leading body building supplement brands in Australia with a good reputation for producing highly effective and high quality supplements for the body building market. They have now introduced the ultimate night protein formulation designed to maximise your muscle gains during sleep. Max's Anabolic Night is a blended, sustained release night time protein with some added sleep support components. We’ll now take a closer look at this product and how effective it is. Utilises Growth Hormone Boosters and Herbal Sleep Enhancers to support muscle tissue growth and for optimising sleep. The above ingredients are collectively known as growth hormone stimulators which are said to have the ability to instigate the natural release of Human Growth Hormone (HGH) that assists with the growth of muscles during sleep. Micellar Casein, Calcium Caseinate, Micro Filtered Whey Protein Concentrate. The blend is made up of pure slow release proteins, in particular micellar casein. It is the ultimate fuel to take before you sleep as it will digest over 8 hours during the night. Whey Protein Concentrate is a medium digesting protein that helps to support a healthy immune system with its milk-based proteins and growth factors. The two natural herbs are added to Anabolic Night to help you maximise your anabolic sleeping cycle. Minerals (Potassium Citrate), Tri Calcium Phosphate, Magnesium Oxide, Ferrous Fumarate, Zinc Sulphate, Potassium Iodide, Sodium Selenite, Chromium Chloride), Vitamins (Vitamin C, Nicotinamide, Vitamin B6, Pantothenic Acid, Riboflavin, Thiamin, Vitamin A Acetate, Folic Acid, Vitamin D3, Biotin, Vitamin B12). Max&rsquo;s Anabolic Night advertises the supplement as the ultimate night protein that will maximise your muscle growth that won’t disrupt your sleep. What makes Anabolic Night formulation special is their combination of slow-release proteins. Micellar Casein, in particular plays an important role in the blend as it has the ability to digest over 8 hours. The benefit of this is that the presence of amino acids in the blood stream are elevated and sustained for about 6-7 hours. This provides a great anti-catabolic effect in preventing muscle breakdown. Anabolic Night also contains slower digesting protein calcium caseinate and whey protein concentrate (WPC). Although whey protein concentrate is termed slower digesting, it will still be absorbed relatively quickly, helping to kick start protein synthesis while calcium caseinate and micellar casein will sustain that process over a longer period of time. This combination of proteins helps to assure stronger growth and recovery overnight. The cumulative effects of this extra growth can mean bigger gains over time. A key part of Anabolic Night lies in its anabolic growth hormone complex. The complex, which contains ingredients like L-Arginine, L-Ornithine, L-Glutamine and L-Lysine is said to have the ability to enhance the release of human growth hormone which promotes lean muscle tissue growth and helps mobilize fat for energy. Another added benefit of Anabolic Night is the added herbal sleep enhancers Skullcap and Chamomile that support deeper, more restful sleep, further supporting your body’s restorative processes. There is nothing fundamentally bad about Max’s Anabolic Night. The formulation contains a great mix of ingredients that work together however, the blends do not list the total amounts of the varying ingredients contained in the blend, making it hard to accurately review it. 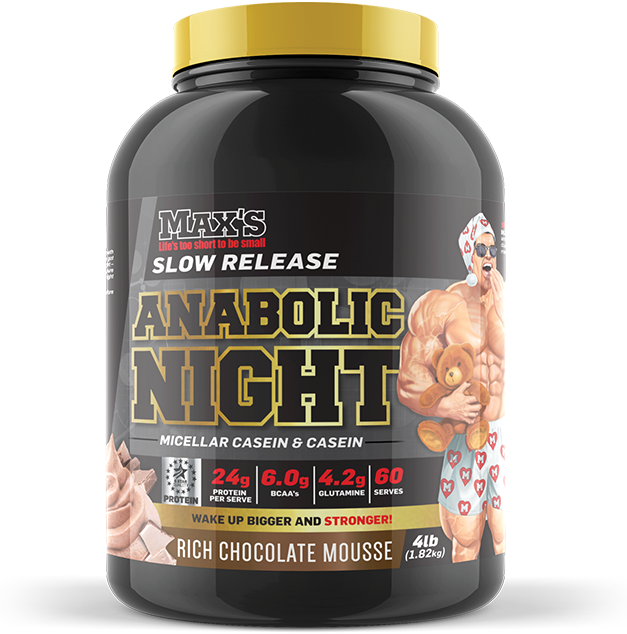 Max’s Anabolic Night comes in two flavours: Rich Chocolate Mousse and Vanilla Malt. The most popular flavour is rich chocolate mousse mostly thanks to its creamy and tasty chocolate flavour when mixed with skim milk. If you enjoy a flavour with more texture, vanilla malt may be an option for you. Anabolic Night has no issues with mixability. Overall Max’s Anabolic Night is a high quality protein product that is suitable for those who want to maximise recovery and muscle growth during sleep. Having a combination of different proteins can assist with protein synthesis and with the inclusion of sleep support ingredients (skullcap and chamomile), Anabolic Night from Max’s is an extremely well designed formula that can help support better recovery and a less soreness from heavier workout sessions.